It's been a hell of ride, with a fair share of high and low points, but the Borderlands 2 season of content is finally at an end. 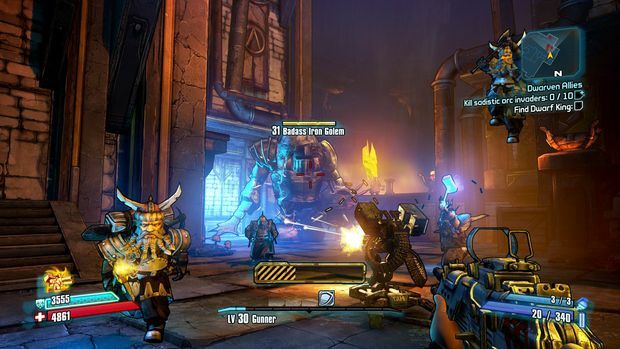 As the last campaign downloadable content for Borderlands 2, there's a considerable amount of pressure for Tiny Tina's: Assault on Dragon Keep to deliver big. "Big" certainly seems to be the keyword here, as Dragon Keep crams a substantial amount of content when compared to the last few campaign packs. 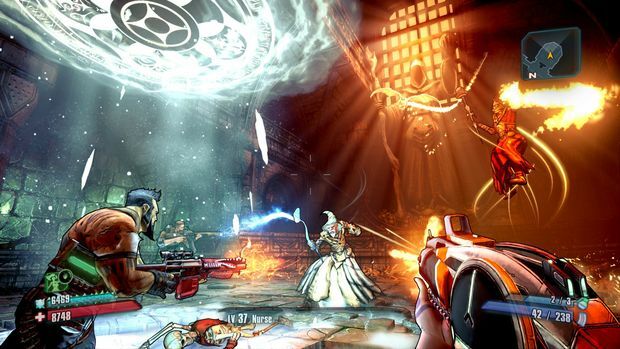 Dragon Keep revolves around Tiny Tina and the Vault Hunters of the first Borderlands as they play the Dungeons & Dragons-style game, Bunkers & Badasses. With Tina as the dungeon master, you can expect things to go far off the rails. The whole adventure is narrated by Tina, with frequent interjections from the other Vault Hunters whenever she makes questionable decisions. Just after starting the campaign, I was faced with an invincible boss, getting instantly downed, only to be spontaneously revived after Lilith insisted the boss be nerfed. So yeah, Tina's still crazy. The visuals also bring a unique flair all their own thanks to the setting. From magical forests, to haunted villages, the aesthetics of Dragon Keep look pretty damn good. Eschewing the murky swamps and arid plains of the last DLC offerings, Dragon Keep's fantasy world is hands down the best looking of the four campaigns, with Borderlands' own cel-shaded style complimenting the world quite naturally. It's not all fun and games, though. The story of Dragon Keep has an underlying morbidness to it, which you'll first glimpse in the opening cutscene, when Tina insists on waiting for Roland to join, or later in the campaign, when Tina asks Mordecai where Bloodwing is. She's having trouble coping with the grief of her friend's deaths, to the point that her mind is in a full state of denial. She will learn to confront her grief over the course of the campaign. Like the real world "*insert game here* helped me through some rough times" stories we hear so often, Tina finds solace and consolation in her time with Bunkers & Badasses. As lead writer Anthony Burch said, "It's sort of this extension of the tea party mission in the main game. Tina can be really fun and wacky, but she's also murdering a guy because he sold out her parents and she had to watch them die because of it. There had to be something dark to go along with her, otherwise there's nothing to take seriously. We also thought it would be really cool to make something about that sort of healing power of videogames and nerd culture in general, and all the friendships that can come from that." 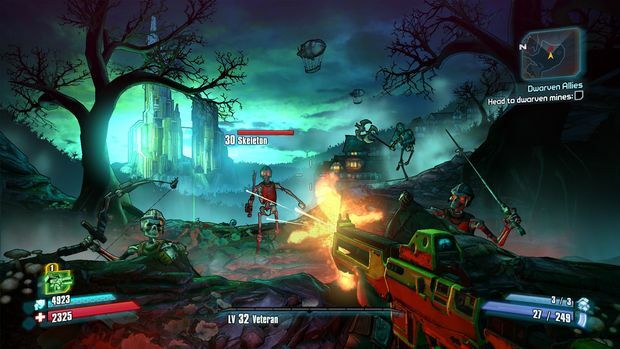 This is still Borderlands 2, so expect plenty of jokes and referential humor. Like the TMNT quest or Rakkman sub-boss of the main game, Dragon Keep takes pride in the Borderlands 2 legacy of pop culture jokes, albeit with a fantasy slant. "In a general sense, we are referencing the idea of fantasy," Anthony told us. "Specifically there is a quest that is all about Game of Thrones, there is a quest all about Lord of the Rings, we reference every damn thing under the sun." Not all of the jokes are as broad and easy to get as a Game of Thrones or Lord of Rings side quests. One in particular rips on bad D&D dungeon masters -- the type that run out of interesting combat ideas and have you solve some random riddle as filler. To a layman such as myself, this joke went right over my head, so it seems there's a sprinkling of inside jokes for the most devout of the nerd species. There's also a fair few shots at nerd culture in general; two quests in particular stood out during my playthrough. The first came via Ellie, whose quest line was a commentary on the often ridiculousness of female body armor in games. The second comes by way of Mister Torgue, who after having his nerd cred called into question by Lilith simply because he has a well kept body, sends you on a quest to defend his nerd honor from this blatant act of discrimination. While the subject matter is more serious, the quests themselves are kept lighthearted through the humor, so I feel confident in saying there's no need to worry about ham-fisted messages here. With the tone and humor looking intact, that leaves the combat. Shooting and looting is still the core of the combat experience, and the loot similarly falls into the fantasy craziness. 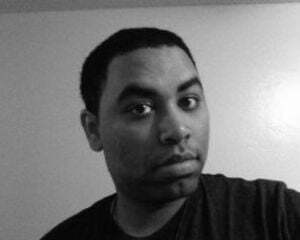 "One of the great things about this DLC is just how it allows us to do more things that don't necessarily make sense," Anthony stated. Some of the campaign-specific arsenals include a gun that gets you drunk as you shoot it, another that fires swords, and even one that shoots spells, with your character shouting out the spell every time you fire. I didn't actually get hands-on time with any of the campaign-specific weapons, so the question still lingers if these guns are a Mr. Torgue's Campaign of Carnage case of style over practicality. Then of course there are the things you actually shoot with your guns: wizards, knights, orcs, tree ents, and skeletons make but a fraction of the new enemy types. According to Burch, Assault on Dragon Keep will actually feature more new enemy types than all the previous DLC campaigns combined. No re-skins to be found here either -- these enemies come with unique AI patterns. You'll fight orcs who can level themselves up if left alive too long, knights who can eat bullets like Skittles if you don't have a corrosive weapon to cut through their armor, and even fairies who you can actually befriend during a fight, giving you and your party periodic buffs to speed, health, and other stats. Dragon Keep will also have its own circle of slaughter, not unlike what was seen in the main game. There is round-based arena combat, though these will have traps and badass level enemies for some rounds, among other changes. And as always, you can expect new raid bosses. All told, there are plenty of reasons to look forward to Dragon Keep. Tina's story of recovery looks genuinely interesting, the fantasy world is truly unlike anything the series has seen before, and it's all wrapped up in that trademark Borderlands over-the-top humor. Vault Hunters, we've got one last tour of duty before leaving Pandora.